Continuous fryer, homemade taste without scorching! Heat is well applied to the ingredients and this raises the product temperature in a short time. Also, as no steam is generated in the drum, the finished food has great fried texture. With IH (electromagnetic induction heating) coil, an operator can freely control the heating temperature, which in turn allows for better frying control. Using the kettle temperature sensor to monitor the frying temperature by numerical value enables an operator to maintain the optimal frying temperature. Rotation speed of the scraping blades and the drum can be independently adjusted according to the product. Lowering the drop distance enables a frying method (for fried rice, fried noodle, etc.) that is better at keeping food intact. 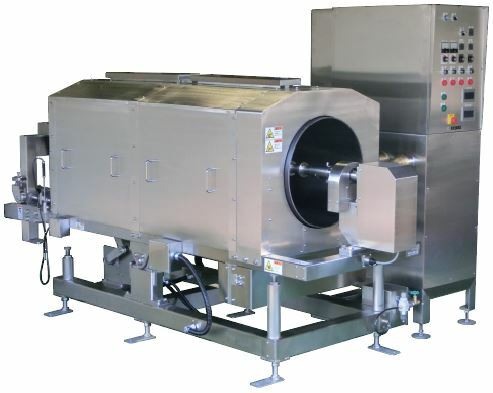 Blade arm/shaft in the drum can be easily detached for cleaning/maintenance (the drum can be made completely empty). To detach from the drum, the blade arm only requires 1 tool while the split type shaft requires a dedicated tool. Fried rice, Stir fried noodle, Rice vermicelli, Spaghetti, Various fried dishes, Various roasts, etc.